What a bundle that looks like. A girl never has too many lights. Up to now I have been a kit kind of gal. As I transition to making my own (scrap) projects I have come to understand the need for lights. Thanks so much for the chance to add these to my stash. Another great giveaway. Who can't use more lights? Great bundle of lights! I am always in need of some nice lights for my stash..
Love these light fabric. They'd make a great addition to my stash. You are right..lights/neutrals, whatever, they are always needed and an assortment helps! Thanks for the continuing giveaways! The gift that keeps on giving….my Christmas sewing starts this weekend and I can promise these pieces won't lay on a shelf . 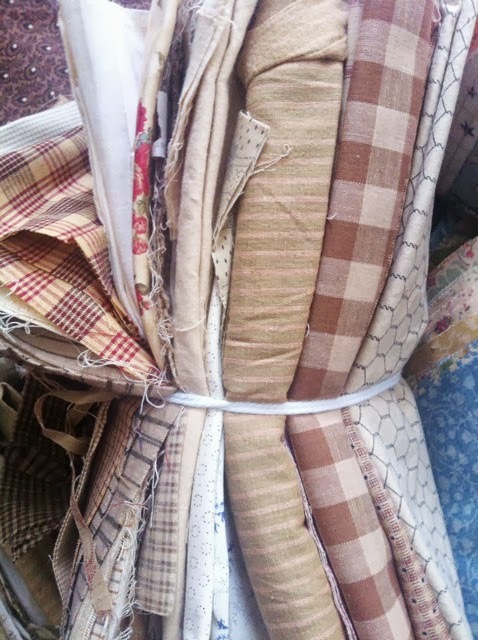 They'll be sewn into gifts for others…thanks for sharing. Now you're talking directly to me..love the lights! It's a great weekend; which started Thursday with the Georgia Quilt Show! Amazing, I got to meet some sewing idols like Diane Harris and Carolyn Beam from Quiltmaker, Rachel Griffith and Freida Anderson (a amazing class!) What a thrill! I am needing some lights right now for a project I'm working on! Would love to win these. I seem to use lights and neutrals faster than any other color in my stash. Thanks for the chance to win. Nice collection of prints! Am loving the stashapalooza 🙂 thanks for all the fun giveaways! Count me in! If it is fabric, I am interested! Thank you so much for sharing. I love plaids! Ahhhh, the lights are just what every quilter needs for fillers and am sure I would be able to use in more than one or two quilts. Would love this bundle! Hi Lissa, What a neat bundle of lights! I'd be grateful to call them mine; as a scrappy quilter I think a good variety of lights is what makes a great quilt. Lovely bundle. I can't seem to keep lights, I have all sorts of colors & prints but almost no lights/neutrals. Thanks for another chance to win. Hi Lissa, THAT is certainly a bundle one could sit and HUG for hours. Great possibilities within, hoping to add it to my well loved stash. Just found your site, and will be returning often. You speak to me. These look like the fabrics I use the most. Oh I hope I win I hope I win I hope I win!!! This is such a generous way to destash. Thanks for all the chances. Great bundle of lights! I even see some homespuns. Would love to win these, thanks for the chance! I have fallen in love with low volume quilts and have slowly been picking up fabric to start one, this would be a great jump start. Never enough neutrals in my stash, so this would be a wonderful win. I love lights- can never find enough! I love homespuns which are really hard to find where I live!!! Thanks for sharing! Would love to win this to begin my stash with! Great fabrics for everyone's stash! Thanks so much for giving all of us a chance to own these fantastic blenders! Never enough lights is a mantra of mine. I tend to gravitate to mediums and darks and have to really make myself specifically pick out lights for my stash.